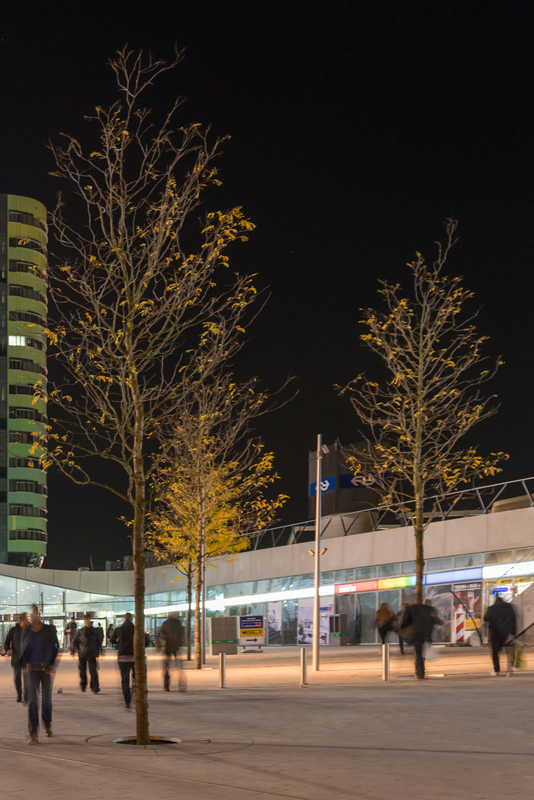 Arnhem Central Station is located next to the city center. The area had been isolated by a main road and the station was a monofunctional space creating disorientation. The new design guides travelers intuitively through the area in order to make the usage of public transport as easy and stress-free as possible. 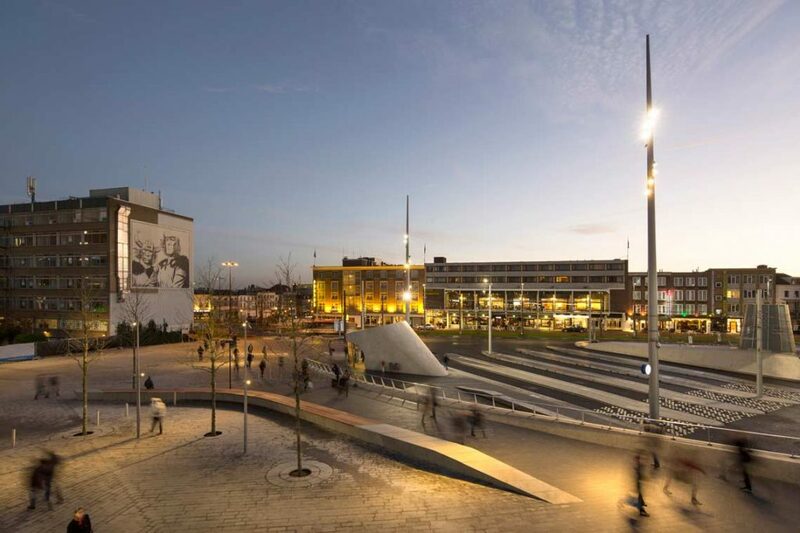 The design reflects the potential of the area to be more than a transition hub by inviting people to participate in a multi-functional place to stay. 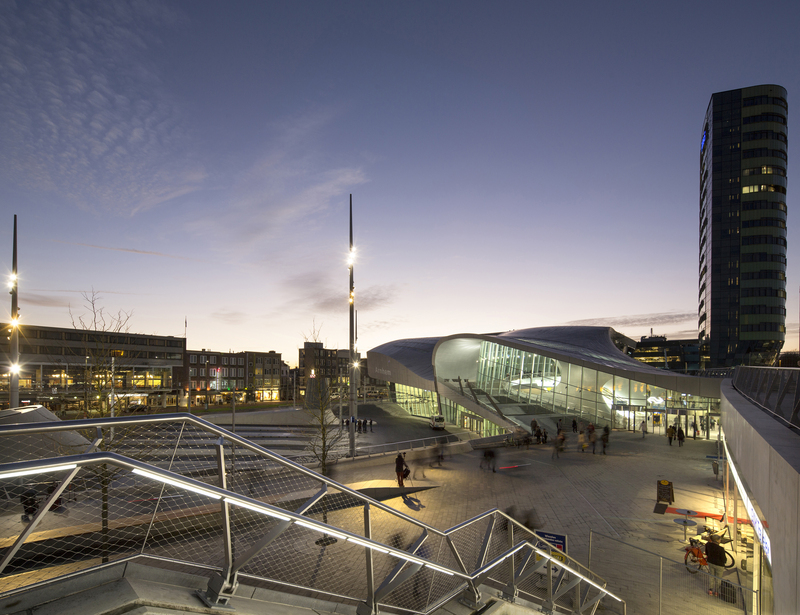 The station and the surrounding public space, including facilities and meeting places, serve as places of encounter for both inhabitants and passengers ensuring the station is carefully integrated into its urban context weaving it into the fabric of the city. 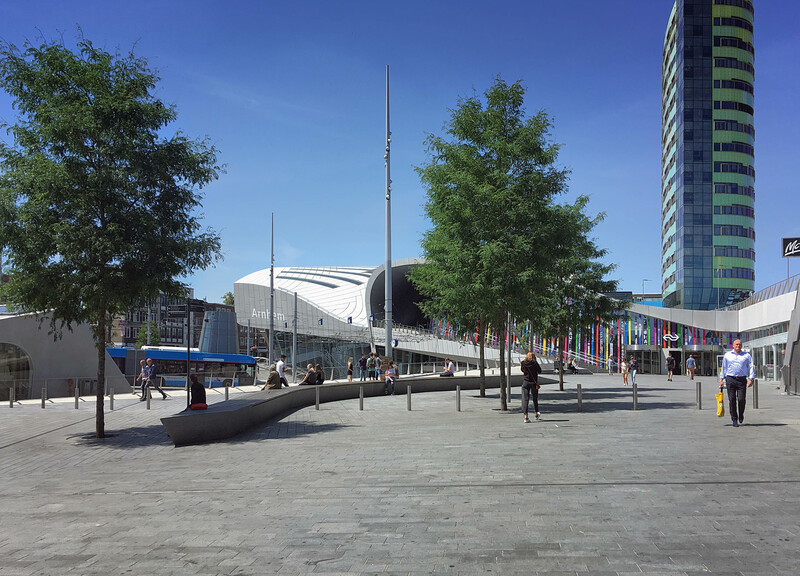 The design of the public space aims to make the routing between the station and the city center intuitive. The station area lies on the slopes of the Veluwe massive, dipping into the lower landscape flanking the river Nederrijn. 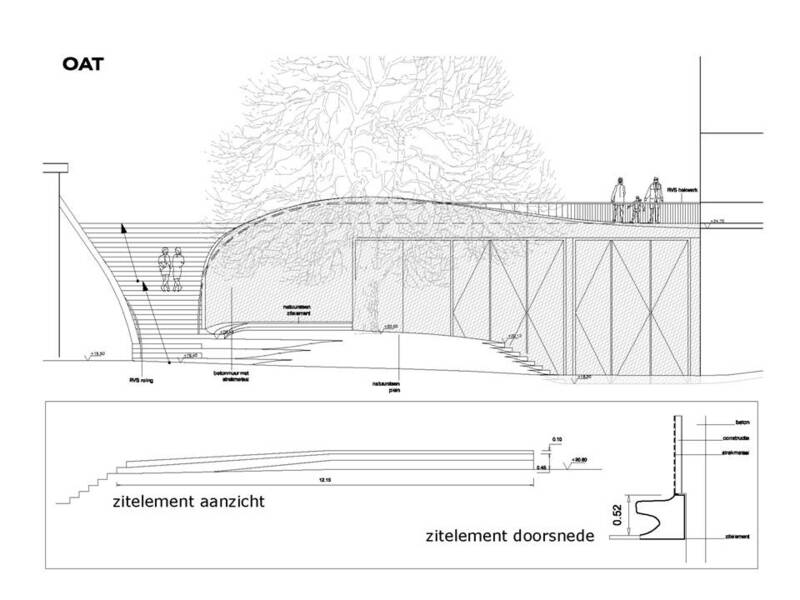 This results in a 20 meter height difference that has to be bridged by public space. 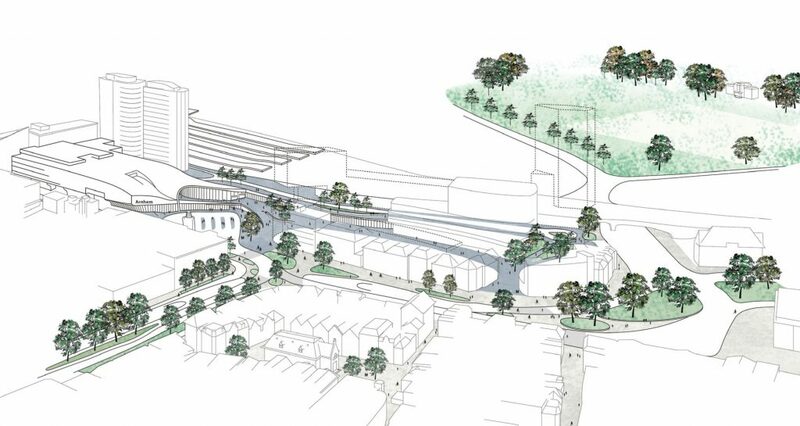 Therefore, the design of the public space is interpreted as a continuous flowing landscape, seamlessly connecting all the different height-levels and streams of transportation. Natural stone pavement is laid in various directions, following the undulating ground surface. Along with the organically modeled station building, it suggests the feeling of standing within a flowing topography. Steel figures subtly mark height differences and thereby set the area in relation to the surrounding landscape. Bigger height differences are bridged by stone folds in the plane. Fitted with wooden seating, the folds transform into benches that emerge from the surface like waves or sand dunes. Following the flow of the surface, the furniture leads people through the open space. 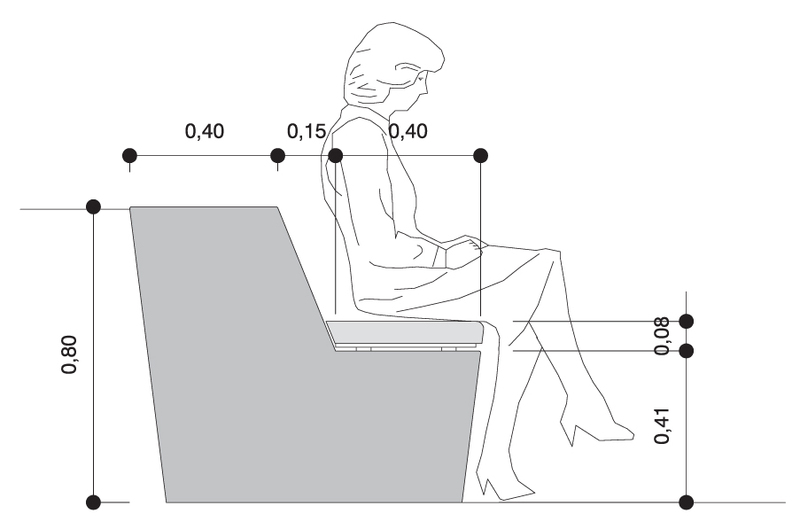 With their concave shapes they invite people to use them as places of to slow down and rest. 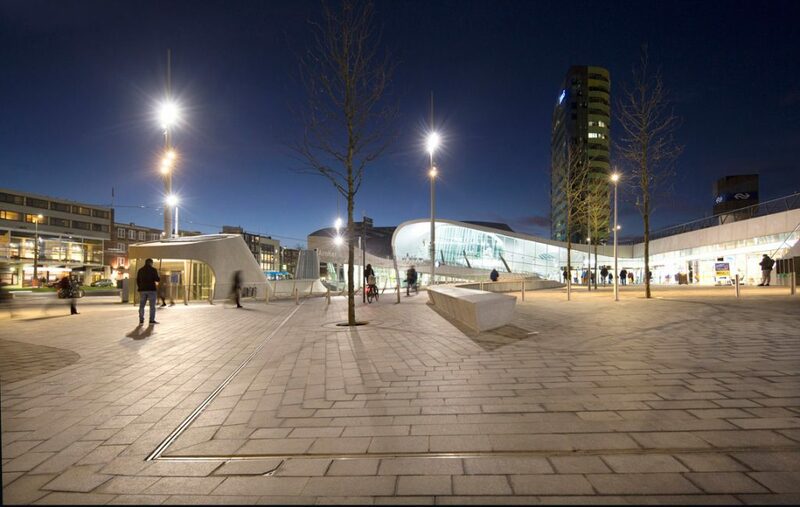 Due to its flowing topography and surface the station area has been discovered as one of Europe’s skater hot spots. Thanks to the sturdy detailing of the ground plane and the durable street furniture, the arrival of these new users is easily accommodated. 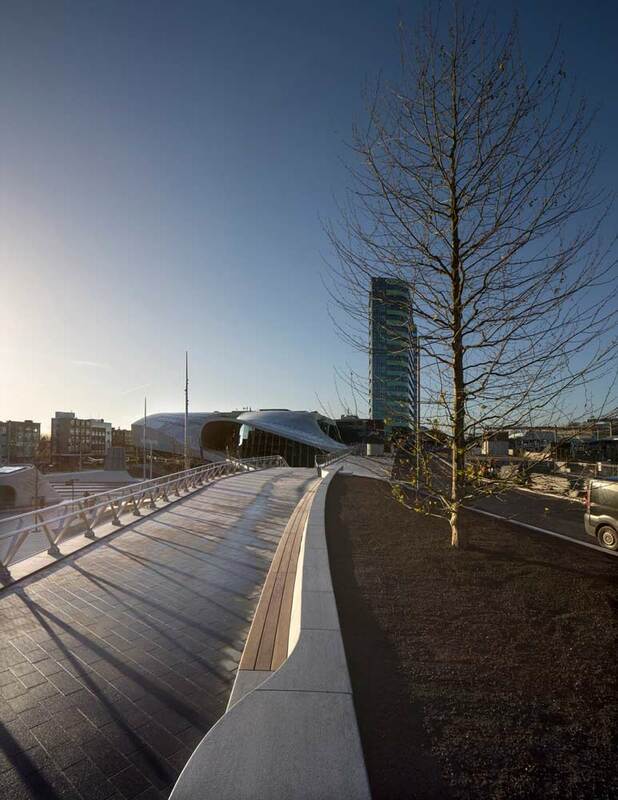 The natural stone pavement follows the undulating surface in different angles. 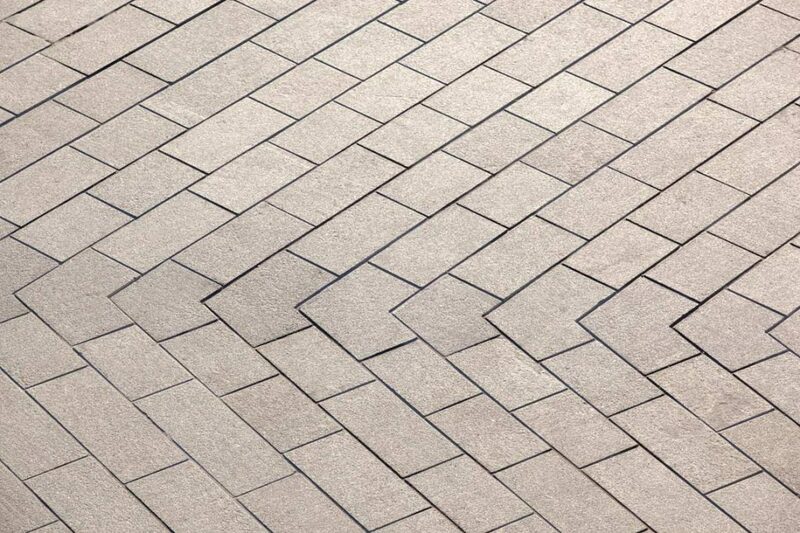 Tailor made paving stones create smooth connections. 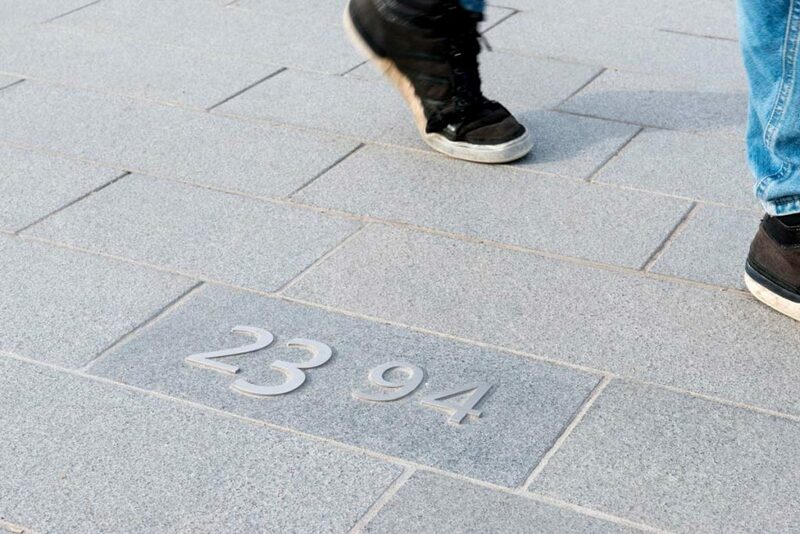 Scattered on the floor are steel numbers, marking the height differences. 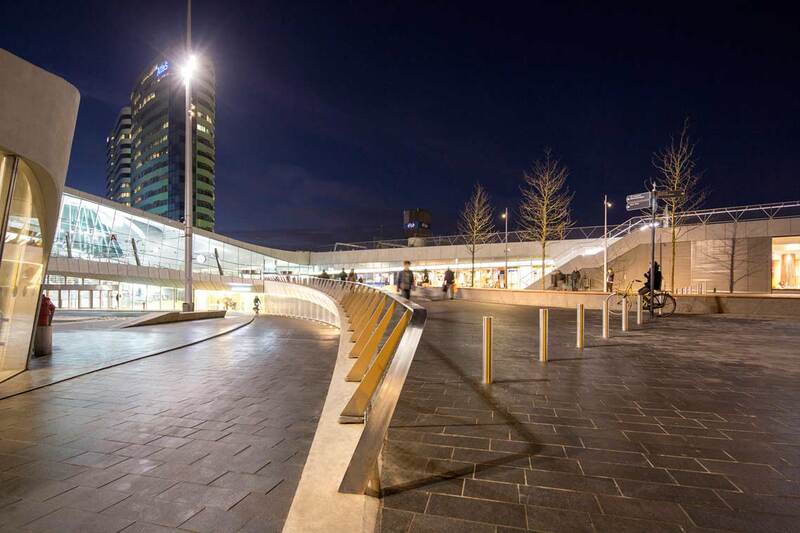 Linear illumination and lighting integrated into the handrails of steps enhance the legibility of the landscape. Small lampposts close to the areas of greenery and seating create inviting settings. In contrast to this sensitive lighting the main transition spots are brightly lit to enhance orientation and therefore increase safety. 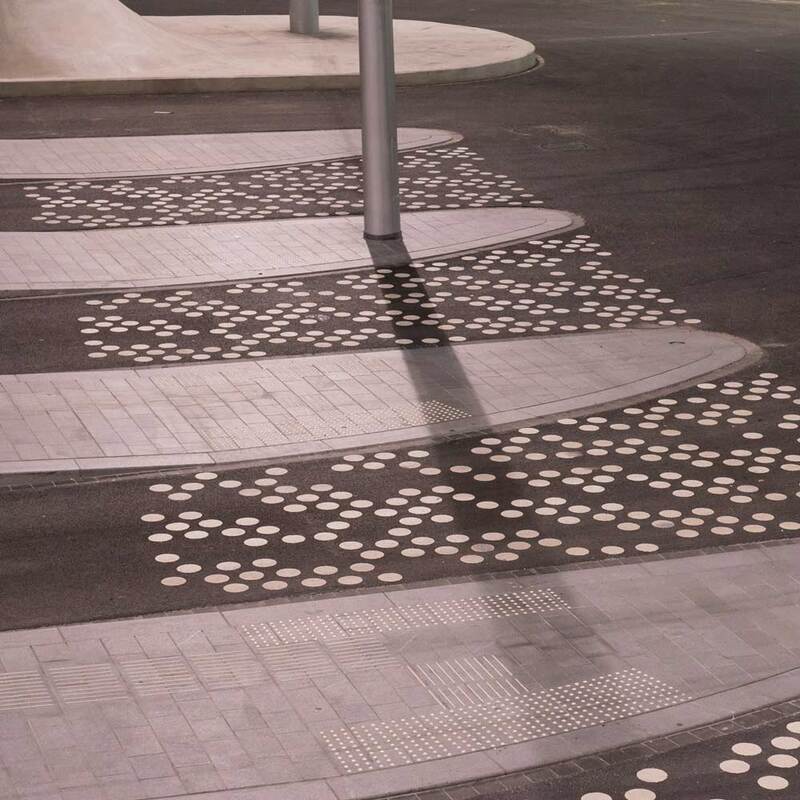 Bigger height differences are bridged by ‘folds’ in the pavement. The station square flows seamlessly in to the station building. Scattered on the floor are steel numbers, marking the height difference.